I came across three jars of the most amazing blends of perfect flavors. 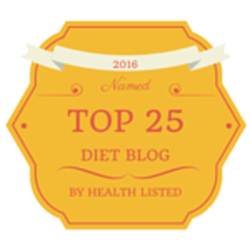 Over this past week I used all three and I MUST share each of these recipes with you. 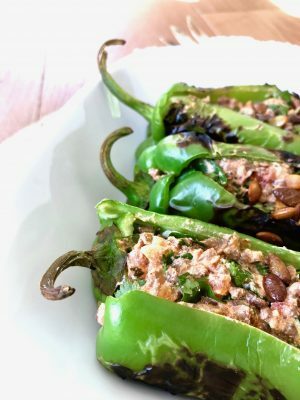 In the below chili relleno side-dish recipe I used their mushroom blend called Zesty Mexican which is a wild and perfect blend of diced Portabella, vegetables and herbs. I did not batter my chilis nor deep fry them. I came up with my own healthy paleo twist. They were a hit twice in one week! I like to make quick and easy recipes. I hope you enjoy this unique side-dish. I made this recipe twice in one week at the family’s request. There were no leftovers either night. Now that tells you something. 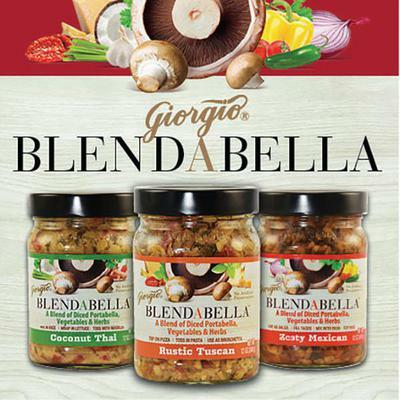 I used a delicious mushroom blend called Zesty Mexican by BLENDABELLA which is a wild and perfect blend of diced Portabella, vegetables and herbs. 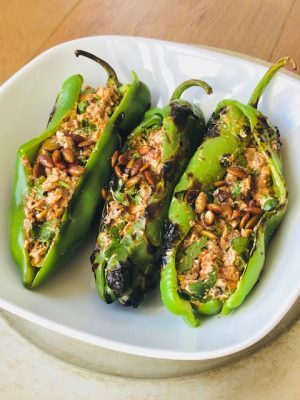 I did not batter my chilis nor deep fry them.I came up with my own healthy paleo twist. They were a hit twice in one week. 2 drops of olive oil. Rinse under water cleaning of all seeds. Roast over a low stove flame until lightly charred. Turning as needed with tongs. * using a broiler is an option, just turn frequently and keep an eye on them. Stuff each one with ⅕ of the mixture. Somewhat close the opening as best as you can. The stuffing will be exposed. Place them side-by-side in a 2.2 qt. rectangular Pyrex dish. Cover loosely with tin foil. Bake on the center rack of your oven covered for 35 minutes. Remove foil for the baking dish. Let sit 5-10 covered with foil or serve immediately. Garnish with pumpkin seeds before serving is optional. 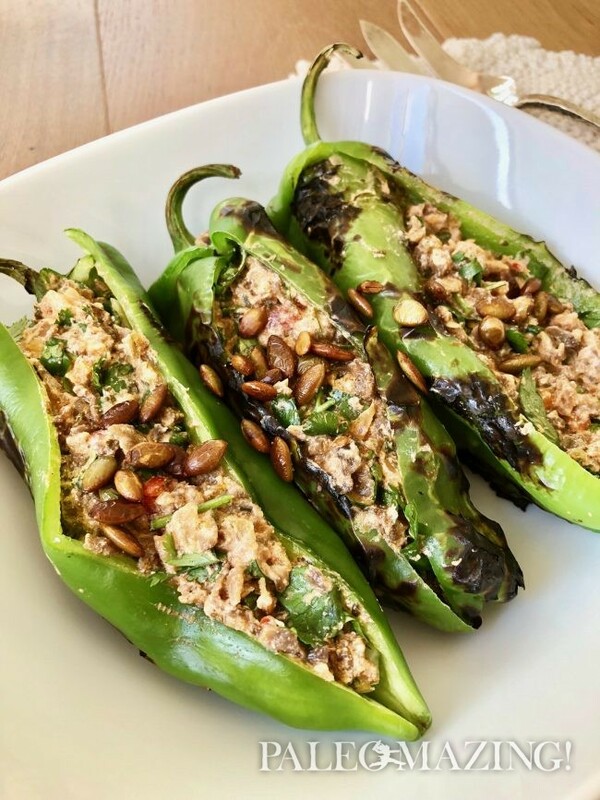 OPTIONAL: While your chilies are baking you may roast your pumpkin seeds over a low flame in a small skillet until golden and browning and add 2 pinches of salt near the end. - you may add 2 drops of olive oil for a crispier oilier flavor during pan roasting. This recipe is presented here as a side dish allowing 1 chili per person. If you have more people I highly recommend you make more and if you like leftovers, make even more! This recipe REALLY is a hit!